Well here’s a good bargain. 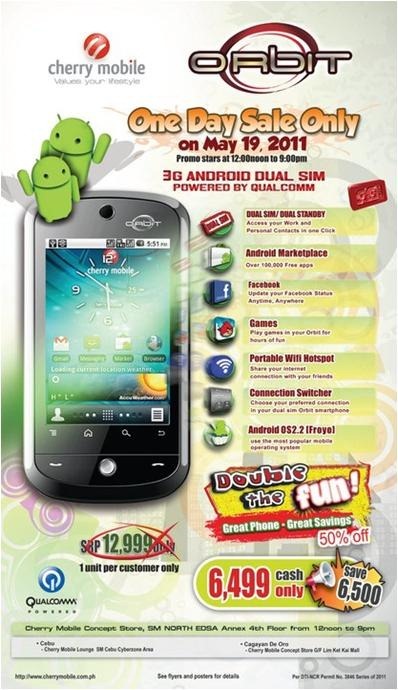 Cherry Mobile is launching their dual-SIM, dual-standby Android phone this Thursday for half the price. The Cherry Mobile Orbit will be launched on May 19, on three Cherry Mobile concept stores nationwide for PHP 6,500. Half its original price of PHP 13,000. We’ve covered the Orbit before when we spotted it on their fliers about two months ago, but it looks like its finally poised to arrive on Thursday. 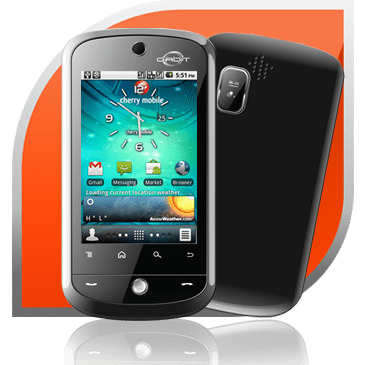 The phone is an Android 2.2 powered, dual-SIM, dual-standby device with a 3.2” 480×360 resolution screen and 528Mhz processor. At the back is a 5MP camera with LED flash. (No info yet of its video recording capabilities) Its major feature, and one of the first to have it – is the dual-SIM, dual-standby capability. This is something we’d like to see more in action – especially since our local market promotes maintaining multiple phone numbers. For those of you waiting for the Cherry Mobile Cosmo, our contact at Cherry Mobile have confirmed that it would be launched this month. Here’s hoping that it comes out with a big sale as well! Update: If you’re curious about the Orbit and want our opinion on performance, we wrote a follow-up feature here: 50% Off Cherry Mobile Orbit-Specs In Review. Thanks to our commenter, Elvie, for letting us know about the Orbit sale! My son got one for me. I tested it just today, 8 pm, may 18. I don’t know what turns out wrong. At first, I already got nervous, because when I opened it after charging, the touchscreen is not responding. I need to touch it harder. I turn it off again, I can’t press no. 4 when I was trying to unpin my simcard, I need to switch on my other cellphone to turnoff the pin so there’s no need to touch no. 4. It did turn on because there’s no password anymore. Then it turned off without pressing the on/off button. I tried to switch in on again, but only the cherry mobile icon displayed. I tried to reboot it, but it’s not turning off. I tried to disconnect the battery and it turned off. I tried to turn it on again, but still, only the cherry mobile icon turned on. Any blogs/reviews about it, please. I’m getting praning already, I need to go to SM North EDSA again to complaint about the unit I got. I really don’t know what will happen tomorrow, are they going to replace the unit or what? I can’t sleep na talaga. I was really hesistant whether to grab the one-day sale, because I want to hear blogs/reviews first before buying one. Those who got one, please reply. I want to know if there are others who experience the same problem. My son got one for me. I tested it just today, 8 pm, may 19. I don’t know what turns out wrong. At first, I already got nervous, because when I opened it after charging, the touchscreen is not responding. I need to touch it harder. I turn it off again, I can’t press no. 4 when I was trying to unpin my simcard, I need to switch on my other cellphone to turnoff the pin so there’s no need to touch no. 4. It did turn on because there’s no password anymore. Then it turned off without pressing the on/off button. I tried to switch in on again, but only the cherry mobile icon displayed. I tried to reboot it, but it’s not turning off. I tried to disconnect the battery and it turned off. I tried to turn it on again, but still, only the cherry mobile icon turned on. i got one from CM SM Marikina, the unit that i bought has a problem, it always turns off and its so slow, i decided to return it to the store lucky me they only have 1 unit left. After they checked my unit and found out that it has problem they replaced it immediately. Thumbs up for the CM Orbit i got all what i needed. Grats on your new phone, and good job to Cherry Mobile for replacing your malfunctioning unit without issues. Hi Elvie. Looks like you got a malfunctioning unit. We bought two and we didn’t have issues like yours did. They should be able to replace it as one of their employees told me that you can return to their store within 30 days if there are any problems. Also try to check if you added any extra screen protectors or thick tape on the device because that interferes with the touch input. Hope that helps and hope you don’t find any more problems soon. We’re currently testing ours and will write about our thoughts on the device soon. Hi Elvie. You can try “Mobile Document Viewer” for reading Office Documents on it, which is free. Its not perfect, but it might do. Some apps won’t run on the Orbit because of the slower processor. We’re currently investigating if there is a malfunction with the WiFi hotspot feature. We bought two units and my personal unit’s WiFi hotspot feature works fine, but the one for my friend seems to be malfunctioning. Will try to reach our Cherry Mobile contact for comment or possible info on how to get it working. Finally, we’re not sure what you mean by not being able to use market apps. Both our units could use the market apps pretty well, so we’re not sure what kind of errors or problems you’re getting. The only limitations so far are the apps that can’t run on a slower processor, and games like Angry Birds which run slowly. Hmm, there might be some things that caused it. Did it work before? Try to unmount and remount the SD card or restart the phone. Our camera/recorder apps work so far. Hi panzerpuff, at last, finally I decided to go back to SM the other day. They reset the phone for the second time, and yes, there’s a problem with the unit. Thanks I was able to catch up with the deadline for replacing the unit. They extended the time of unit replacement until a new delivery comes in, they don’t have a stock so far. So I’m waiting for my new phone. I was asked if I want to upgrade, replaced it with Cherry Mobile Nova and just add P1,500. I said, Orbit is the latest, why should I downgrade the unit? They said Nova was already proven to be good and effective. I said, If I’ll change it to Nova, I’d rather get Samsung Galaxy Mini which is only P8,500 but I’ll think about it. What do you think panzerpuf? If you’re not looking for the dual-SIM capability, the Orbit has a slight edge on screen size, resolution, and memory than the Mini. But the Mini has more processing power, and has a more proven track record/Quality Control with Samsung. I don’t like the idea of downselling the Nova unit to us at the regular SRP though. That’s like getting their money back from selling the Orbit at a discount and then some. I’ve tried a Nova before and it runs Angry Birds pretty well and seemed pretty solid and stable, but even if it has a 600mhz processor and proven stability, it seems like you’re paying extra to get a downgraded phone. Plus Nova usually comes with Android 2.1 and they’re working on upgrading it to Android 2.2 Froyo still. I don’t want Android 2.1 specifically because only Android 2.2 has the WiFi hotspot application that I use everyday. Was not able to check in today for their Orbit firmware update as I went out of town and using the Orbit as my WiFi hotspot out here. Felt it was risky to have it undergo an upgrade process when I needed it. I’ll have it upgraded when I get back. Sadly, all these little niggles that people are experiencing and the hassle of the service center update process leaves a slightly bad taste in the mouth. I hope the phone redeems itself after all the replacements and firmware updates are done. Hello Panzerpuff, good morning. forgot to get back at you after getting my new unit at SM North EDSA. I tried to explore it first, install apps that I used to install on my first unit and tried many more. You know what? I am now very much satisfied with my Orbit. I got the new version (updated Android version 2.2.2). the battery now runs longer — lasts almost 24 hours, unlike before that I need to charge it almost 3 times a day. I can now share my wifi hotspot, the camera and camcorder are now working. the only game that I installed and uninstalled was the Angry Birds, it runs very slow, I don’t need it though because I am not a game fanatic. but everytime my child wants to play with it, she looks so disappointed. so far, I’m happy with my nova. I just don’t know why my new unit doesn’t have a screen protector, they said if it’s just a replacement, there’s no screen protector. Is that right? I called the CM service center where can I buy it, but they said, I need to wait until there’s some in the market. I was told to go to Robinsons Malate, but they don’t have it there including the casing. sorry panzerpuff, my mistake. I should have said I’M NOW HAPPY WITH MY ORBIT. Hi Elvie, congrats on your new replacement! It looks like you got a working phone and thankfully Cherry Mobile is doing its part to get broken phones replaced without (hopefully) much hassle. I was dreading about writing regarding the defective Orbit’s before the issues were resolved and it looks like there’s at least some good news to share instead of bad. I believe there are also no available casings for this phone. Supposedly you can buy a case for the LG Optimus One and it can make do – you just need to cut out holes for the camera. I’m using the Orbit without screen protector and case right now. Have dropped the phone maybe 4-5 times at about 2-3 feet so far. Not a lot of scratches on it though, maybe because it landed on smooth floors. Hope that helps. Enjoy your phone! hi there……how to activate the GPRS, mms and 3G? What network compatible of this? Smart is not compatible of this model ( ORBIT) to activate the GPRS, MMS, & 3G…. Hi Cheryll, you should be able to get it all working just by having the correct APN settings for GPRS/3G and MMS. Sometimes, you need to send an activation code to your telco to say something like “MMS ON” and/or “GPRS ON” so those services get turned on for your SIM. Check the SIM Toolkit if there are any options available to configure and/or enable the services, that might do the trick. For new-ish Smart SIMs the settings come preinstalled so once you put them into the phone the phone recognizes these settings. On Android you just have to highlight the GPRS setting you want for it to work. It is the white circle that when you tap gets a green circle, which means it’s selected – this is on your APN settings menu. hi? why does my camera doesn’t work and it will just display force close? what’s the problem? please help… thanks. Hi Johann, try to restart your phone or remove some apps that might be conflicting with it. If you recently updated your device, try to re-install the update and it might get fixed. A phone reset might also work. If all else fails, you might have to have your phone checked at a Cherry Mobile support center. hi….panzerpuff…. ! i have cherry mobile orbit works well before,binili ko to last july 2..but at this time yung softkeys hindi na mag response at this time….. i try to update the ddevice thru cherry mobile site…but still the same…unresponsive softkeys…sana software lang ang problema nito….kasi dito sa cherry mobile service center sa cebu hindi cla mag repair if hardware ang problema….kailangan daw ipadala dyan sa manila…. Hi Jude, based on our review and experience, that seems to be one of the common issues with the Orbit. We don’t know if its a software problem or hardware. But some Orbits have phantom taps while others have unresponsive buttons. Sometimes rebooting the phone works, but for a permanent solution we’re not sure what would work. Hopefully you can show it to the Cherry Mobile service center and they’ll determine what to do about your phone. Do keep us updated on the status of your device. Hi Eduardo, unfortunately we wouldn’t know the password since we haven’t tried that phone yet. If you still have the manual maybe the default password is listed there. Otherwise, try to bring it to a Cherry Mobile service center to have it unlocked. Hope that helps! Not that I’m complaining, but slow loading instances times will very frequently affect your placement in google and can damage your high quality score if ads and marketing with Adwords. Well I am adding this RSS to my email and can look out for a lot more of your respective interesting content. Make sure you update this again very soon. you happen to be interested feel free to send me an email.